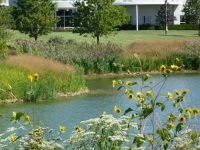 One of the easiest ways to enhance the landscape's ability to manage water more sustainably is to strategically install landscaping that features native plants of the tall grass prairie region. Native plants have deep root systems that will help build soil quality, which increases infiltration and reduces runoff. Native plants are tolerant of weather extremes and don't need fertilizers or pesticides. 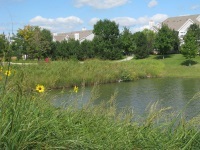 Native plants also create habitat for birds, wildlife, butterflies, and other species. 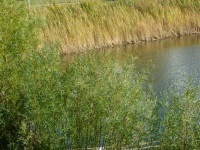 After establishment, native landscaping is less expensive and easier to maintain.